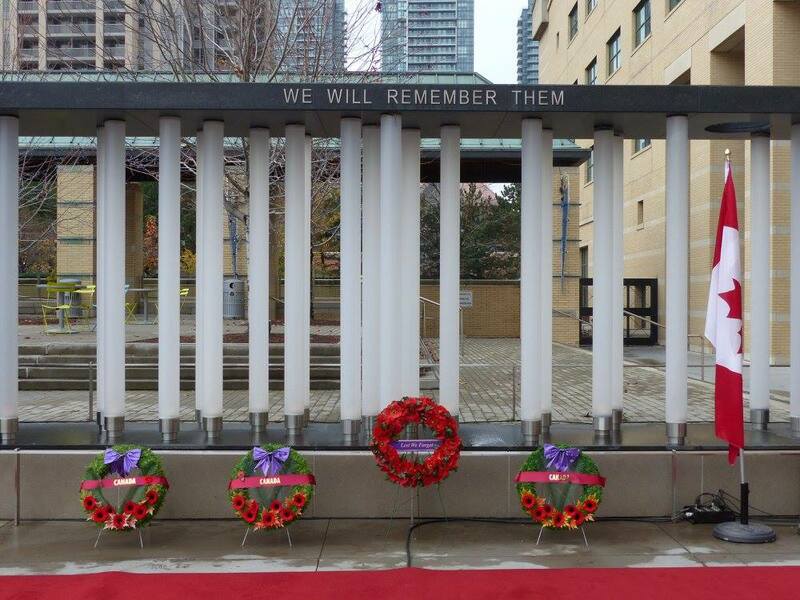 The City of Mississauga observed the Remembrance Day on November 11, 2015 at 11:11 AM at the Mississauga Civic Centre Community Memorial at the City Hall. The wreath laying and the commemoration ceremony was held at the Community Memorial. 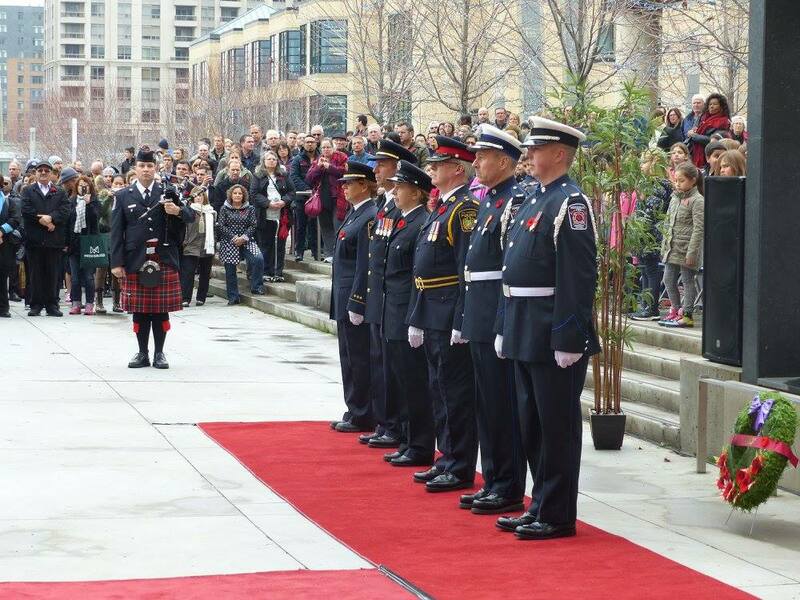 The Canadian Flags in the city were lowered to half-mast in honour of Remembrance Day. The Community Memorial consists of a black granite rectangular enclosure with 21 electrically lit candles. These candles represents the 21 gun salute to all the martyrs. Atop the structure, the inscription ” WE WILL REMEMBER THEM” is etched in golden letters. 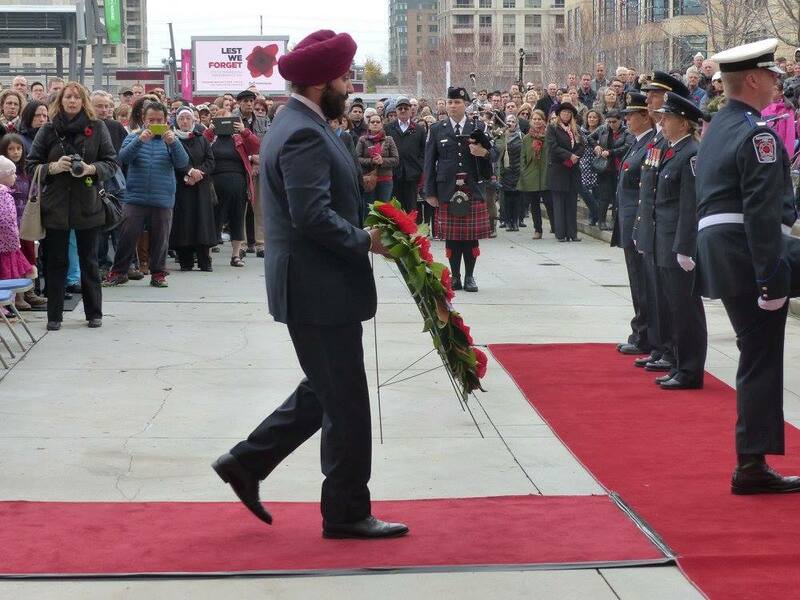 The proceeding was lead by Honourable Navdeep Singh Bains, Minister of Innovation, Science and Economic Development and MP for Mississauga-Malton. Apparently we were the only two India origin attendees among a thousand. The City Commissioners of Police, Fire, Transit, Emergency Medical Services, City Security, all were in attendance. About a thousand people of the City of Mississauaga braved the chilly November morning to assemble at the Memorial to pay their respects and honour the veterans who made sacrifices during times of conflict and those who are still making sacrifices today. There was a choir of primary school children from the neighbouring school in attendance. 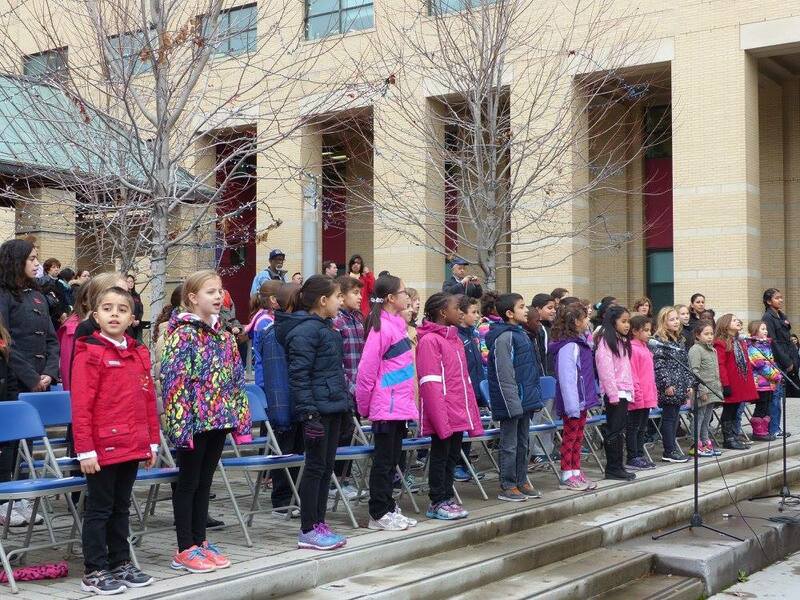 The schools are where the children usually first learn about who and what Remembrance Day is for. Schools, from Kindergarten to High Schools, go into why we need to give respect and they will usually have an assembly and a veteran or a serving soldier addresses the students. After the assembly, the first hour in class is spent on discussing the sacrifices made by the soldiers and the students are urged to come up with the details of family members, relatives or friends who served or are still serving with the armies around the world. The ceremonies begun with the singing of The Canadian National Anthem. The poem, ‘From the Flanders Fields’, from where begin the tradition of pinning the Red Poppy on Remembrance Day, was recited. 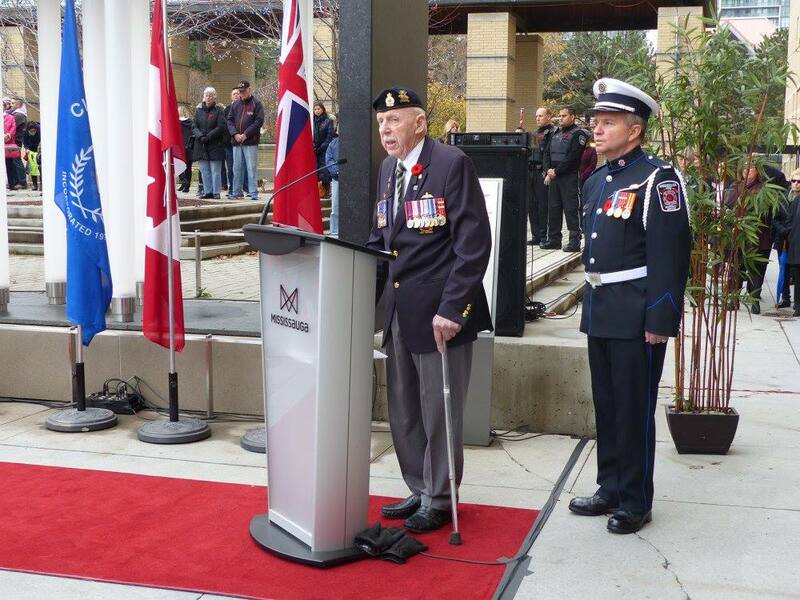 The oldest Veteran of the city, Major Robert McNally, a World War II Veteran, gave the memorial address to a standing ovation by the crowd. This was followed by the sounding of the Last Post with a two minutes silence. After that was the wreath laying and all the people trouped past the Memorial, removed their Red Poppies and placed them there. The history of the City of Mississauga can be traced to the Mississaugas, an Ojibwa band, which migrated South and settled in the area around the delta of Credit River by the 1700s. ‘Mississauga’ translates as ‘River of the North of Many Mouths’. Through the ‘Mississauga Purchase’ agreement of August 1805, entered by the British Crown and the Native Mississaugas, the Crown acquired over 74,000 acres of land. This area came to be known as the Credit Indian Reserve. The Mississaugas surrendered all their lands later to the crown through various treaties. This area today forms the cities of Toronto, Mississauga, Brampton and Caledon. By 1847, the Mississaugas relocated and settled in the New Credit Reserve near Brantford, about 100 kilometers South-West of Toronto. The British settlers started arriving by 1800s. They established the villages of Clarkson, Cooksville, Dixie, Erindale, Malton, Meadowvale Village, Port Credit and Streetsville. By the amalgamation of these villages, the Town of Mississauga was created in 1968, and the City of Mississauga was incorporated in 1974. Today, the City of Mississauga has grown to be Canada’s sixth largest city. During the World War I, it is estimated that around 800 men enlisted from Mississauga. There are stories about a football team from Port Credit, where all six members reportedly went and enlisted after a game. 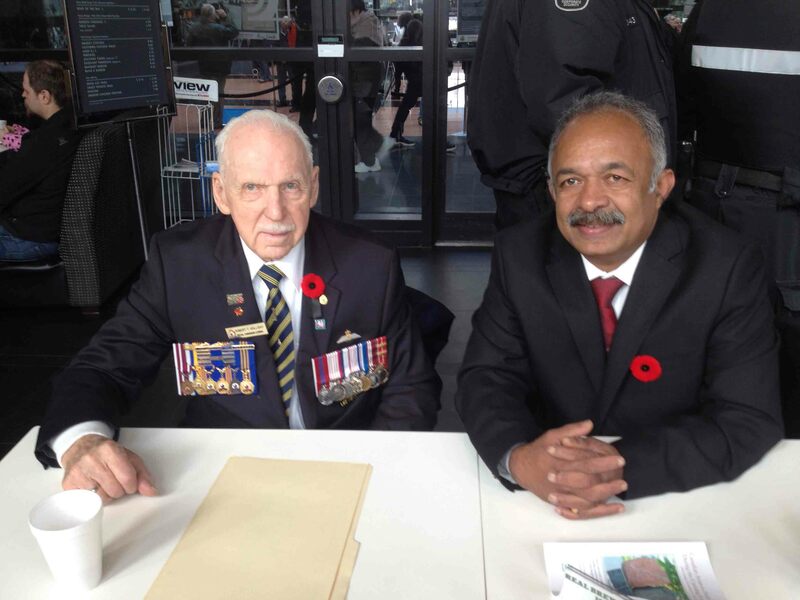 It is also said about an article in a local newspaper chastising the Streetsville community for having a lower enrollment than Port Credit in an attempt to shame the men of Streetsville to enlist. These brave men fought and died at every major battle, including Vimy Ridge, Somme, Passchendaele and Ypres. 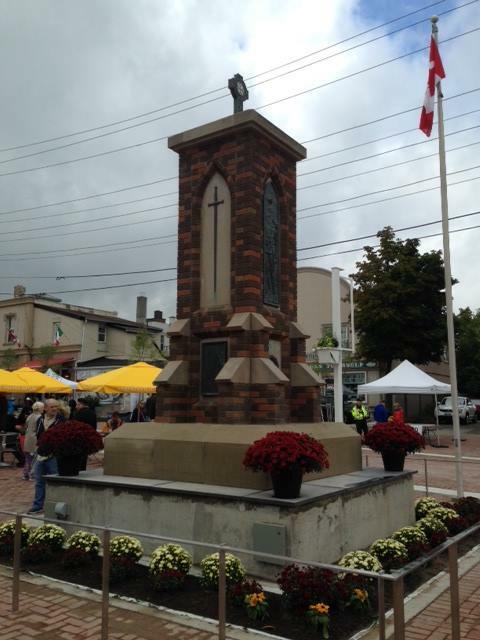 On July 01, 1926, this monument was unveiled in memory of local veterans who died during World War I in the Village of Streetsville. This 17-foot high Cenotaph has been the centre of many gatherings and ceremonies over the last 70 years. The names of veterans who served in World War II and the Korean War were later added. 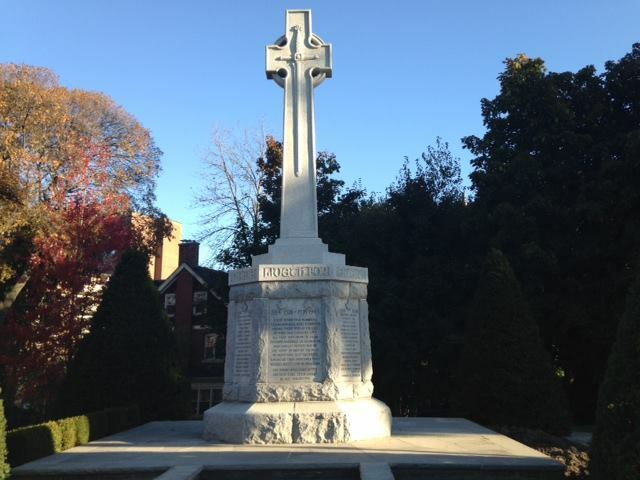 Over the years, the Cenotaph and its foundation had deteriorated, and the City of Mississauga, assisted by a dedicated community of donors, undertook the restoration work. The Remembrance Day ceremonies in 1993 was conducted at the restored monument. On November 11 of every year, ceremonies are held in remembrance of all those who laid down their lives, the veterans and the serving soldiers of Canada. The village of Malton played a key role in aircraft production and development for several years. This memorial is featured in two parts. First is the traditional cenotaph, second is a static aircraft displayed in the same park. The aircraft is a CF-100, which was produced in Malton, from 1951 to 1958. It bears the markings of the 414 Squadron from CFB North Bay. A plaque on the cement pedestal gives thanks to the local production of this all-weather fighter from the cold war era. The CF-100 monument was erected on this site in 1974 by the Malton branch of the Royal Canadian Legion. The Malton Legion was also a driving force behind the 1978 unveiling of the cenotaph which pays homage to the war dead of Malton and surrounding regions. Mississauga’s oldest Cenotaph was unveiled on November 9, 1925. It was designed and constructed by Louis Temporale who received the Order of Canada for master craftsmanship in stone masonry. It was built to honour the men who answered the call to serve in World War I. In 1946 and 1983, the names of the soldiers from the area who fell during the World War II and the Korean Conflict were added. Solomon P. Ortiz, Jr, a former Member of the Texas House of Representatives aptly said “To honor our national promise to our veterans, we must continue to improve services for our men and women in uniform today and provide long overdue benefits for the veterans and military retirees who have already served”. Nice to see you taking part here in Canada. Reji… where are your medals bro? Col Reji the true soldier & the gunner. However. how many of us spare time to be with our national heroes…?????.!!!! Hi Reji, We are planning to have a World Class War Memorial for Martyrs from Himachal Pradesh. It will be nice if you could send us some options, designs etc. Our main stay is an architect who knows building architecture. Not war memorial. I still remember the spot where the 21 pillars stand to depict the gun salute at the memorial.. It is incredible to see the oldest veteran taking pains to be present in full rig!! We in India need to take lot of lessons from west but unfortunately our leaders and public are bent upon rediculing certain minor glitches and they all still refuse to come out of their delusion about greatness of akhand bharath. I wish there is another Reji living in India amongst us…..so that the routine of the day to day life is made look awesome to read , record and retrospect! !